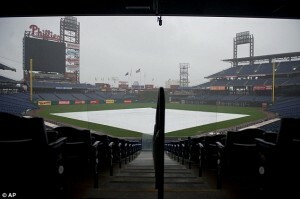 The Phillies begin an epic stretch of 33 games in 31 days to close out the 2011 season tonight in Cincinnati. That means no days off, 20 road games including three series against the NL Central, two day/night doubleheaders against the Marlins and Nationals respectively, and six more head to head games (the exact number of games by which they lead the NL East) with the second place Braves during that time. Admittedly, I missed baseball over the weekend, but this seems excessive. The Phillies played an epic six hour and eleven minute, 19 inning game against the Cincinnati Reds on Wednesday night and hearing the words “that’ll move Chooch from the catcher’s spot to third base” woke me from the half sleep I had fallen into. After running out of pitching options well after midnight, manager Charlie Manuel had no choice but to bring in a position player to pitch for the top of the 19th inning. Selecting second baseman Wilson Valdez as the new pitcher, Placido Polanco moved from third base to second. This was followed by catcher Carlos Ruiz (“Chooch”) moving to third, being replaced by backup catcher Dane Sardinha. 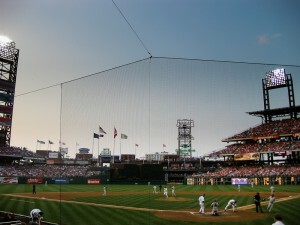 Valdez recorded a full inning of work and earned his first Major League win as the Phillies scored in the bottom of the 19th behind his pitching. Tags: beer and art go great together, flyers, Phillies, Roots family picnic, since I mention the bike race I will consider this my Sports post, that's exactly what a canadian would want to do, Why'd she have to go and make things so complicated?